Are you struggling with movement in your iStopMotion projects? Action is one of the hardest components to a stop motion animation – too few frames and the video will look jumpy, too many and the time it takes to film will substantially increase. The example above is the perfect balance, and it involves a whole lot of movement because it’s a bicycle race! It was created using an iPad Air wireless connected to a MacBook Pro with iStopMotion. Who will win the World Championship Cyclocross 2015 in Tabor? Watch the video to see it all in smooth, flawless action! What part of animating do you find trickiest? Send us the final project and tell us how hard you worked to get there here! With the seventh installment of Star Wars in the final stages of production, galactic adventures are on the forefront of everyone’s mind. Star Wars: The Force Awakens will be released December 18th, 2015 in IMAX format and is guaranteed to be an action-packed adventure with revolutionary special effects. If December 18th is just too far away for you then turn to YouTube animator Woodrow Village to get a quick astronomical fix. Using Boinx’s iStopMotion app for Mac he was able to take viewers through a step by step journey of creating a space ship and receiving a successful transmission. We are now inspired to make our own Star Wars-worthy space craft. While we’re at the drawing boards check out more of Woodrow Village’s brickfilm videos here! As hundreds of global viewers logged on to share the excitement of Mr. and Mrs. Tiger’s three new owlets, temperatures in Oklahoma City dropped. The Click family, who we introduced you to in Monday’s post, and especially oldest daughter Alessondra, have endeared a pair of Great Horned Owls to the world through the popular live steam Alessondra’s OKC Great Horned Owl-Cam. For the last four seasons, the Clicks have documented every aspect of Mr. and Mrs. Tiger’s exciting and educational owl lives; from the hatching of new eggs, to the fledging of hatchlings, to every midafternoon snooze that the Tiger Owl family takes – we’ve been able to watch and be a part of it all. It’s no surprise that the public has become very invested in the well being of America’s royal Owl family. What is going to happen to the babies in the winter? Are the new eggs going to handle cold? How will they keep warm as the country is bombarded by polar vortexes and record breaking lows? How cold does it even get in Oklahoma City? Enter the BoinxTV WeatherSnoop Layer. 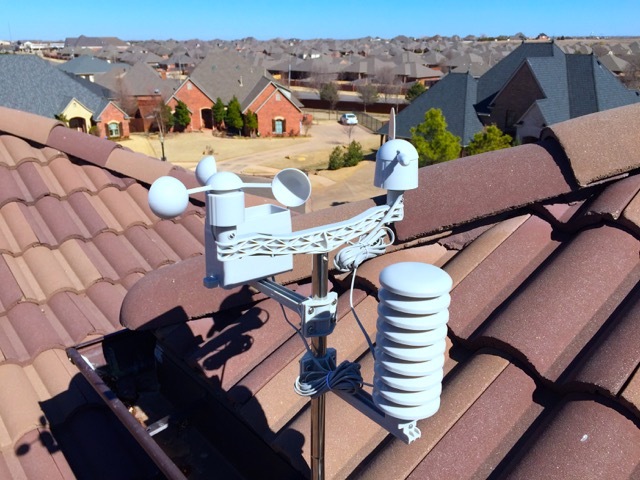 This convenient new layer lets you connect BoinxTV to your go-to personal weather station (like the one the Clicks use) via WeatherSnoop and instantly display live weather data directly into your broadcast. Check out what the end result looks like in the screen shot above! So to all of the loyal Tiger family fans who are worried about the status of the new babies, the live stream now automatically features a full, up-to-the-minute weather report. Isn’t technology just a hoot these days? Visit the Click’s Ustream page for more information on Great Horned Owls, their live stream, and the story behind it all. Excited about the iCar rumors? Cornelius Koch and Steffen Troeger's brickfilm animation reveals what will make it special: iWater. Designed in California. A rather Orwellian look at the economics that make the world's largest corporation tick. Excitement is afoot at the Click family residence in Oklahoma City, where a pair of Great Horned Owls known as Mr. and Mrs. Tiger just welcomed three new owlets, with millions across the world watching live. As of Monday, February 16th, Java, Malaya and Caspian have joined the family of Great Horned Owls who have called the Click’s house their own home for the past six years. The Clicks – Jeff (dad), Deziray (mom), Alessondra (9 years) and Giavauna (4 years) – produce the popular live stream, Alessondra’s OKC Great Horned Owl-Cam, which can be viewed at all times on Ustream. As of publication, more than 5.5 million people from across the globe have watched the Tiger family nesting in a window planter on the exterior of the Click’s house. Now in its “fourth season,” the (human) family has live broadcasted the (owl) family laying and brooding eggs four consecutive years, as well as the hatching and fledging of said owlets. To produce the live stream, the Click’s use a Mac Mini running BoinxTV. According to the family’s Ustream site, “the stream is output in 1080p directly to Ustream.tv by a Taradek VidiU, a video encoding device that has a hardwired uplink to a high-bandwidth Internet connection.” Using a combination of Logitech C920 and C615 HD webcams plus two robotic Logitech BCC950 conference cams, viewers can watch the family of Great Horned Owls from a variety of angles around the clock. Though the Clicks, with the help of dad Jeff, have four cameras set up, only two USB cameras can be connected at once to the hardware. All are connected to separate 30-meter amplified USB cables that run to their “tech closet” where the Mac Mini is located. Using BoinxTV, they can switch camera angles depending on which one has the best shot at any given moment, as well as display combined picture-in-picture and zoomed shots. The setup runs 24/7. Be sure to tune in to Alessondra’s OKC Great Horned Owl-Cam to see Mr. and Mrs. Tiger and their brand new baby owlets, who will (hopefully!) be fledging within the next six to eight weeks! Visit the Click’s Ustream page for more information on Great Horned Owls, their live stream, and the story behind it all.